Parallel evolution is a funny thing. 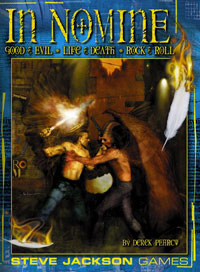 Just as Kult hit shops in Sweden prior to Vampire: the Masquerade debuted in the English-language market, so too did the French game In Nomine Satanis/Magna Veritas, by Croc, hit the French market before Vampire 1st edition hit the gaming market. Based on playing demons and angels masquerading as human beings in the modern world, it’s even closer to the core concepta of the World of Darkness games than Kult is. The game casts player characters as angels and demons – either working for divine or infernal superiors, or outcasts – and runs off a “D666” system, where to resolve actions you roll 3D6 with one die distinct from the other two; the two similar dice you add together to get success or failure, whilst the remaining die determines the magnitude of success or failure. If you roll all 1s, God intervenes, and if you roll 666 Satan gets to play; whether this is good or bad depends on whose side you are on. This mechanic is one of the few flashes of humour to carry over from the original game, which took a witheringly satirical approach to religion which Steve Jackson Games by and large toned down. Perhaps they were worried that it wouldn’t play well in the Bible Belt, though given the basic concept of the game and the fact that it has zero qualms about letting you play demons I suspect that wasn’t an issue. It seems more likely that, since they were trying to ride the White Wolf wave with this, they were going for a correspondingly serious tone, what with this being the era of pretentious declarations of trenchcoat-and-katana RPGs being high art and all. The problem is that in removing much of the humour, they don’t replace it with anything similarly compelling. The book is somewhat more flavourful to flip through than GURPS, but that just means it has slightly more spark and flair than your average phone book or technical manual. The discussion of one’s celestial superiors suggests a certain Paranoia-like tendency towards backstabbing and political snafus and the like, but this isn’t expanded on very much. You get all sorts of cool powers, but little idea of what you’re supposed to do with all that – a problem with many World of Darkness games which the book authentically emulates. Somehow, Steve Jackson Games manage to make the war of Heaven and Hell boring. That’s an accomplishment in a way, but not one to be proud of.